Taking a short snack break while driving along a remote leg of a solo road trip, spirited 20-something Charlotte (Dequenne) has a minor verbal run-in with a gang of loutish bikers at a roadside food van. Shortly afterwards, she picks up a hitchhiker named Max (Biolay) and takes him for a coffee at a rundown café, La Spack, named after its middle-aged female proprietor (Moreau). No sooner have they sat down than the bikers arrive threatening violence and sexual assault on both Charlotte and Max. A fight breaks out, but before the incident escalates too far, La Spack steps in with a shotgun and sees off the bikers with threats of her own. Following the ruckus, and while Charlotte passes the time engrossed in a video game, Max mysteriously disappears after heading off to the bathroom. Suspicious, and concerned for her new companion, Charlotte returns to the café after dark to investigate. Shortly afterwards she finds herself waking up bound and caged in a dank farm building, the prisoner of La Spack. It quickly becomes apparent to Charlotte that she is very soon going to be added to a menu specially tailored to suit a particularly fussy group of diners. Described by Todd Brown over at Twitch as an "interesting, compelling bit of work [with] impressive gore set pieces," The Pack, the debut feature from writer-director Franck Richard, is a gory slice of new wave Euro-horror whose cast of includes Benjamin Biolay (Stella), multi-award winning Belgian actresses Yolande Moreau (Gainsbourg; Seraphine; Amelie) and Emilie Dequenne (Brotherhood Of The Wolf; Rosetta) and renowned French veteran, Philippe Nahon (Switchblade Romance; Irreversible; Brotherhood Of The Wolf). 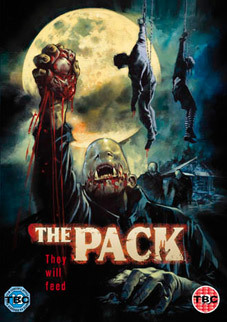 The Pack will be released on UK DVD by Icon Home Entertainment on 4th July 2011 at the RRP of £15.99.